My mom makes the best dumplings. She made them for breakfast for me and my sister for breakfast, soft pillowy goodness smothered with my grandma’s home churned butter and topped with sour cream and either fresh berries or fruit preserves. When I just got married I tried to recreate her yummy recipe and failed miserably at first. Whenever I asked my mom for a recipe I would get something very vague – “Oh you just take the farmers cheese, add some sugar, add some salt just enough flour to hold everything together, form a log, cut into pieces and boil in salted water, they are ready when they float”. Sounds simple enough – now, but for a novice it was all some kind of a culinary puzzle. My poor husband was my subject in the dumplings experiments that I conducted for two weeks in the row, every day. First time I made them – they were so so rubbery you could burn 1000 calories just chewing them. The other time they disintegrated in the pot as soon as I added them into the hot water, although I was clever enough to strain the mess through the fine mesh strainer, form a pretty square, and camouflage the top with some sweetened sour cream and macerated strawberries. It looked very appetizing, so it was interesting to watch my husbands facial expression change when he took his first spoonful and then bravely finished his food. Slowly, I got the proportions right and my dumplings were almost as good as my mom’s. A few years ago I found a wonderful recipe, by a Russian Journalist and book writer Veronika Belotserkovskaya, of her version of lazy dumplings made with ricotta and chopped rosemary. 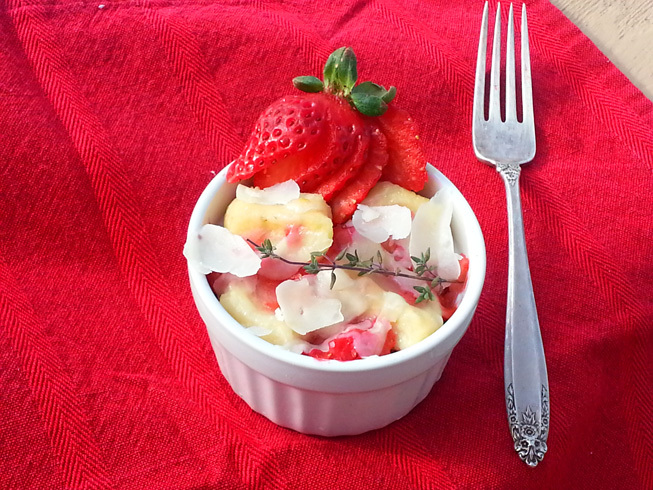 I loved her idea of baking the dumplings with strawberries and cheese, and decided to recreate the recipe. It was a huge hit with my family, and now I am sharing my rendition of this wonderful recipe with you. 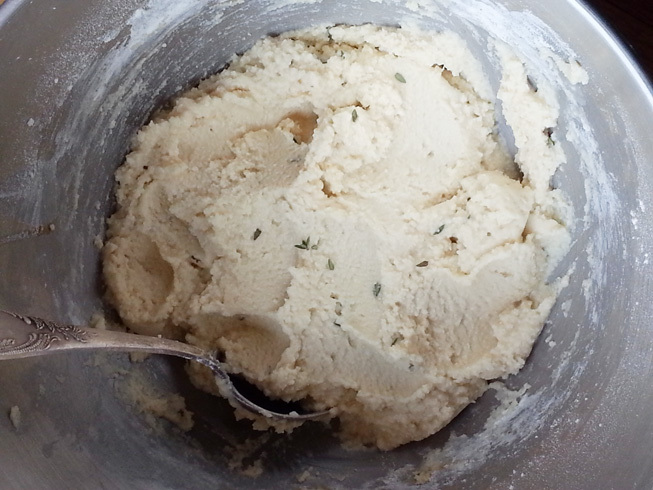 Mix ricotta cheese with a mixer until smooth, add the eggs , sugar, salt , melted butter and thyme leaves. If the ricotta is very ” wet ” – add more flour. If ” dryish ” – water. Pour onto a well floured surface( the dough should not stick ), knead and form into a log . They must be “fluffy .” Do not overdo it with the flour. Cut the log into small pieces with a sharp knife about 1/2 inch in length and place onto a floured board or plate. Boil salted water in a pot and and add dumplings in batches. Once they float, remove them from the pot into a bowl and toss with a little butter or oil. 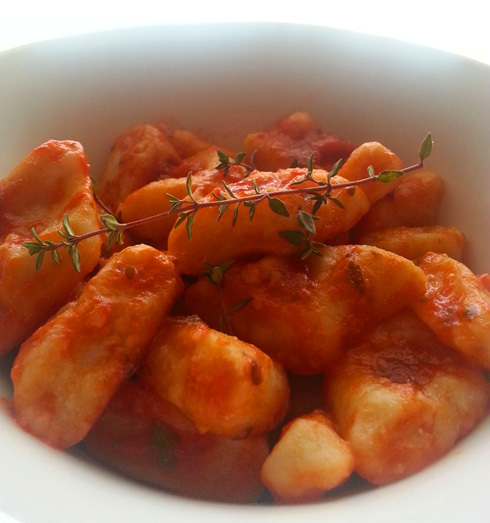 Place the gnocchi into ramekins. Processes strawberries with powdered sugar in the blender. 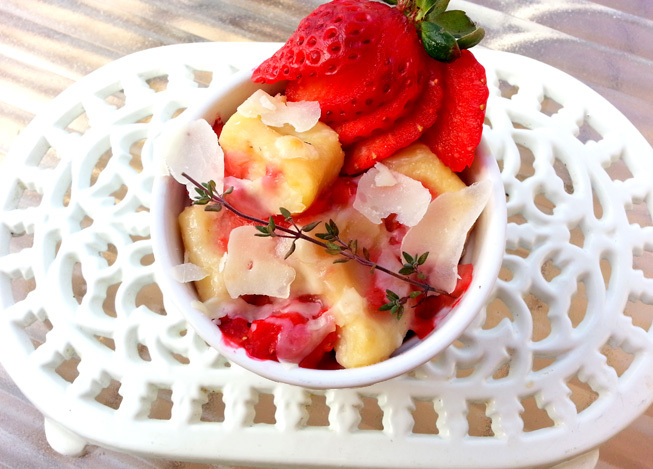 Top gnocchi with milled strawberries, add to each serving a piece of butter, and top with thinly sliced ​​Parmesan . Place the ramekins for a few minutes in the oven, preheated to 350 F.
I used half as a dessert and the other half, tossed with basil tomato sauce as an entree .